...of the rest of our lives. well if the rest is like today, then, mmmm yes, please. we managed to hit about 4 items in our magic book. 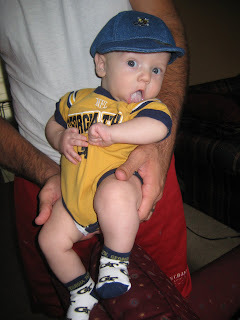 little man's first GT game day. head to toe GT and tummy in between! (please note the NFL logo on the GT jersey...i think this hand me down came from cuba where licensing is sketchy) thanks at least 3 woodward north ladies for this getup! 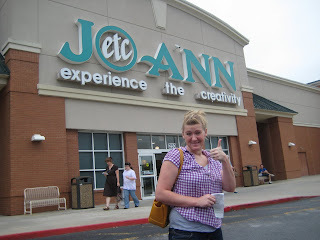 joann, to, as they say in the slogan, "experience the creativity" (note to self: must lose 30lbs immediately). so we got a bunch of the extra soft cloth diapers and some cool fabric and thread and we were on our way. 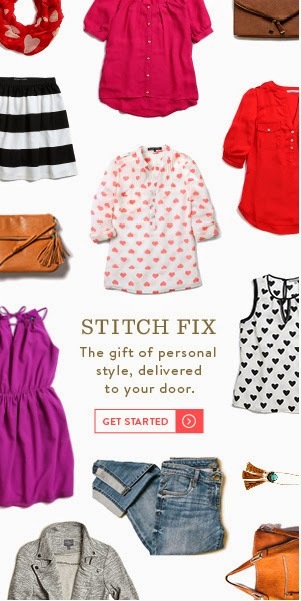 except i forgot one key thing...a sewing machine. 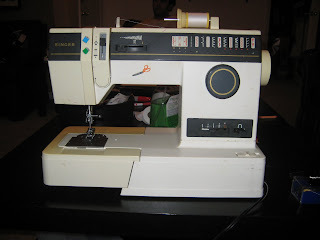 i have never touched, much less used, a sewing machine in my life. i made the mistake of telling jesse this so he sure as hell wasnt going to let me spend the $200 that a decent one would cost just to attempt to make some burp cloths that i may or may not ever even bother to complete. despite my reassurances that, "i'll use it every day, i'll practice so hard, i promise i'll feed and clean up after her! please?" he still said no. but he thought his mom had one, so went went to the dukes place and despite being derailed by their new 52" flat screen and college football opening weekend, we were able to unearth the freaking iron maiden from the attic. i was intimidated and wouldnt even get close enough to try to work the thing. i was getting extra whiny and accusing jesse of dreamstealing since he didnt know how to work an antique sewing machine and wouldnt buy my a new one. ha ha, geez, what a jerk. being the loving, supportive guy that he is, he made a few calls and finally talked to our buddy, darren phillips, whose sweet mother, a master seamstress, had recently passed away. darrens family was over at her house cleaning up for a yard sale and happened to have not only an old machine she had worn out before buying a new one ready to go to the sale but also darren's sister, something of an expert herself, on hand to give me a rundown. it was awesome, all we had to trade were a few judah snuggles (if pimping my child's hugs out for crafting goods is wrong, i dont wanna be right) and we got a beaut of an old singer and a 10 minute lesson on threading a similar, newer model, machine and how to go about copying our cute burpcloth. i refused to try the machine out in front of everyone because i touch diapers enough everyday, and i dont think i need one physically attached to my hand (which was a real fear). so we grabbed the retired machine from the garage and brought her home, cleaned her up and had at it. it was a little difficult because the machine i saw darren's sister use was about 10 years newer than this one, and the threading process was way different. luckily hubs came to the rescue *again* and found a video for how to thread it on youtube. i was on my way! 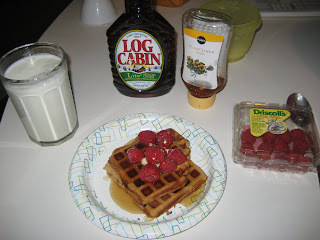 so after threading the machine we realized we were hungry from all our colorful living and decided to pull a NieNie again and make her other recipe from the waffle blog. we made the dough from scratch and chopped all the ingredients: corn, zucchini, canadian bacon, garlic chunks, mozzarella, and red onions with a yummy sauce of ranch, bbq sauce and valentina hot sauce (thanks del angels) mixed together. 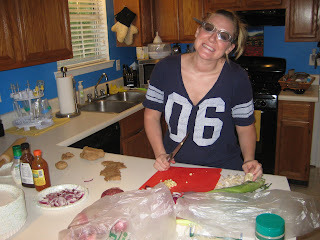 i HAVE to wear swim goggles while i chop onions or i give up within seconds. evidently a bra is NOT required. the verdict: the toppings were DELICIOUS altogether. 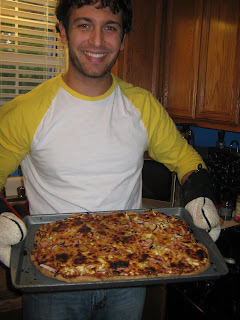 the crust was yummers, but we didnt roll it thin enough so it was a little stiff on the bottom. user error. after 3 pieces i was sustained enough to start my project. 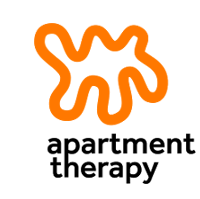 after several reboots, here is my first effort. my first ever sewing machined craft and pretty much the first ever thing i have created with my hands (uterus gets credit for judah) that will be of true use to anyone. i jacked up the left side by not leaving enough of the black cloth to reach, so i had to fold the diaper over and make a seam over there so there wouldnt be a random white margin. i think this is admirable for someone with 10 minutes of education/experience on a differnt machine than i used, and nothing but a completed project to try to replicate. 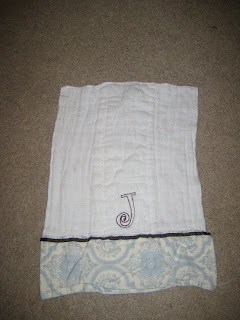 bonus point for remembering to wash and dry the materials before sewing so they would be pre-shrunk. i am confident its at least nice enough to rub all up in some bodily fluids! so throw in a visit with grandaddy bob and aunt elena, a chance hangout (and judah-feeding) with kellen and kaycee, plus a tech win and UGA loss, and we had a PERFECT day. a big fat 10. it was magic. 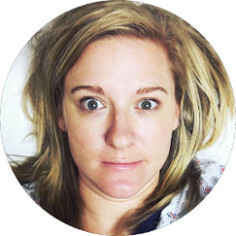 -must be prepared to stop and breastfeed baby for 30 minutes at any moment since child continues to need sustinace every 3 hours regardless of where we are and what degree of verticality we have acheived so far. -lots of hilarious crafting type people hang out at joanns on a saturday. theres enough material there for a whole 'nother blog...and i dont mean fabric. -college football is the perfect all day background noise, filler, to keep you stimulated when bored without stealing you from people and projects. 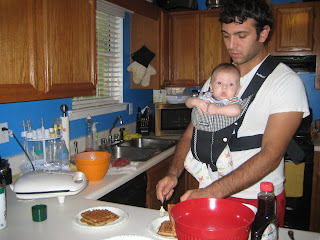 coming soon: labor day eve tradition begins, plus judah puts his head in the clouds. I am dying at the goggles right now. Why didnt I ever think of that? Way to go Dukes! I'm sure I read this and didn't comment, but so glad you referenced it in 2013 so I could (re) read it again. 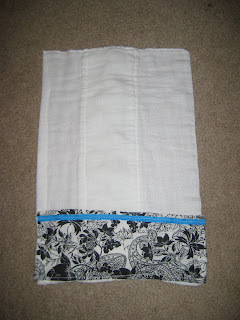 I love remembering being a small (deleted) part of your first sewing project, and SO glad you didn't let an old machine stop you!! Look where you are today as a seamstress...good call not to despise small beginnings (extra points for Bible ref)!